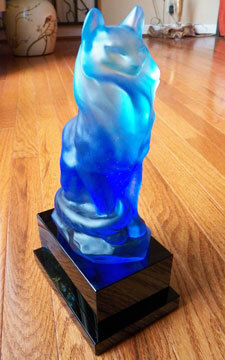 AA-14815 Blue Pate de Verre Glass Cat on Base. Glass making process has been used since Egyptian times and then the Romans. It is process in which glass is cast in a mould typically by kiln or other methods. Internet has many articles and video which describe the process. The glass in this case appears to glow which gives it a nice look. Cat with base is 12 inches tall. Base is 6-3/8 inches long by 4-1/2 inches wide by 3-1/4 inches high. Cat by itself is approximately 8-3/4 inches tall. Base is made of glass. Piece is inscribed I. Roubleff. Beautiful piece of art glass at a very reasonable price. Note there are some very tiny bubbles near the front of the cat. Part of the process but doesn't detract from the piece.